If you are trying to gain a competitive advantage for your online marketing strategy, then you are going to need to develop great content that gets found and engages your customers. The new wave of digital marketing is based on working with your customers to drive qualified traffic, and an essential part of this marketing strategy comes from a content strategist. Many business owners, and even some marketers, have a difficult time defining what content strategy is and what a content strategist does. In short, a content strategist creates content that resonates with your audience and engages new segments to widen your customer base. Content strategy is a mix of storytelling, competitive research, and Search Engine Optimization. The reason that it is difficult to define a content strategist is that the breadth and depth of marketing knowledge that is demanded this position is extensive. 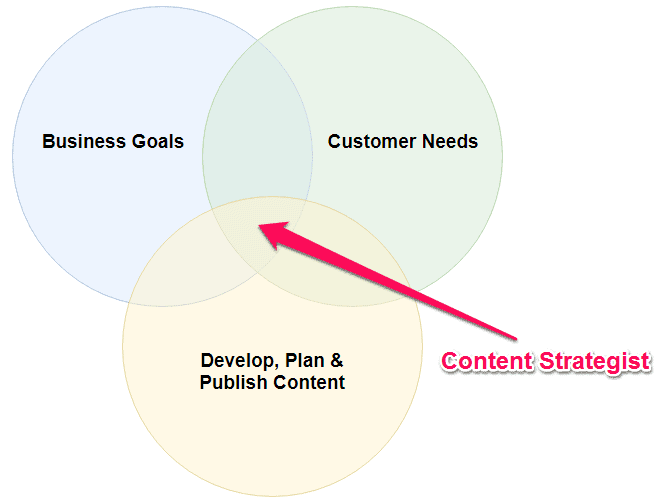 To produce great content, a content strategist needs to develop a strategy for business content. This requires competitive research, market research, and an understanding of the needs of your customers. This is the most notable aspect of a content strategist because this specialty requires a holistic understanding of your business needs and align those needs with your business goals. Here is a quick list that outlines specific tasks that content strategists take part in. This list is a general view of developing a content strategy to help your business drive qualified traffic and boost sales. Create relevant content based on your company’s brand and ideal customer. Develop a strategy to help your business create, optimize, and publish content based on your customer’s needs. Lead the content decisions across all aspects of your business. This requires a content strategist to combine various departments and align different goals. Establish your brand’s tone, style, and voice for the customer experience across your entire business. Develop an editorial strategy and content workflow to ensure that all content is consistent and compelling across different marketing channels. Optimize content to get found in search engines while also focusing on the needs of customers to drive conversions. Utilize analytics to measure and analyze content performance. This will show what’s working and what is not working. Adjust content strategy based on content analysis. What Skills Does A Great Content Strategist Need? Content strategy is a broad approach to online marketing that requires experience in several areas of digital marketing. Not only does a content strategist need to be proficient at specific marketing tasks, but then also need to have a strong background in planning and presenting content ideas to your team. Here are some of the most critical skills that a successful content strategist needs. While planning, optimizing and publish content is essential for your company’s online marketing strategy, if your content strategist is not a superb writer then your content strategy is likely to fail. The writing process is one of the most important pieces of content marketing, and it often falls on the content strategist to orchestrate and create content when needed. Your content strategist should know how to understand the needs of your customers and align the content process with your business goals. Whether you are looking to create content on your blog, email, or social media accounts, a content strategist should have a strong understanding of the process regardless of the channel or platform. Depending on how your team is arranged you may need a content strategist who is also a freelance copywriter. Having this ability means that your content strategist can drive the content creation process in the short term while you build a larger team, or the strategist can handle content needs for your company in an ongoing capacity. Producing great content is essential for online marketing, but if your content is not found online, then you are wasting time and money. A great content strategist should have an extensive background and knowledge of SEO marketing practices to get your content found in search engines. Each type of content like blog posts, social media, videos, ebooks, and guides all play their role in a great content strategy. A highly trained content strategist will know how to leverage each type of content based on the needs of your business and drive qualified leads to your site. This approach will help you build a strong digital marketing mix to build your online presence and boost sales! Once you have great content that is optimized based on the needs of your customers, a content strategist will need to lead the effort to publish on appropriate channels. This stage of your content strategy needs to be handled by a professional because you can have everything right up to this point but stumbling here can result in poor performance of the entire campaign. A content strategist will either handle publishing efforts on their own or work with your marketing team to determine the best channels for distribution. Planning this is recommended because your business needs to have the time and resources to create great content. This means that your content strategist should keep an updated content calendar for all of your marketing needs throughout the year to help your team stay on track. Since your content strategist will be leading the efforts across multiple marketing channels, you should expect them to have experience in the channels you want to target. Having lots of experience in email marketing is great, but if your company needs to boost your online engagement with educational blog posts, then that email marketing experience could have limited impact on your goals. Content strategists need to have experience planning, delivering, and executing highly effective campaigns across multiple marketing channels. They also need to understand how to measure and analyze results to improve future content marketing efforts. Based on your business goals, a content strategist will need to help you develop content to reach your objectives. The purpose of content is to help drive qualified leads, engage customers, start conversations, or make more sales. A content strategist needs to know how to plan, optimize, and publish content that helps you reach your business goals. This can change based on your product, service, and market, but your content strategist should know how to identify and plan around your goals. 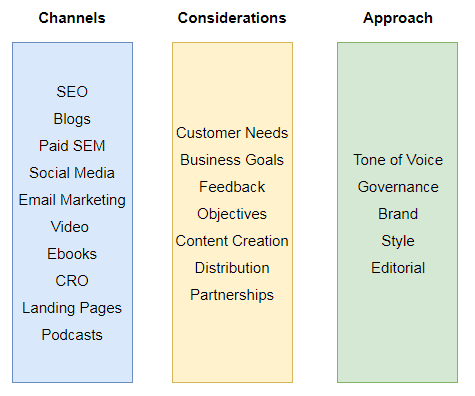 Developing a holistic content strategy is difficult, but an organized approach to content marketing can help you achieve your online marketing goals. This means that your content strategist needs to know how to organize and plan content with precision around your company goals. Since your company is in a highly competitive market, your content strategist should work with your company leaders to ensure that you have a take-charge approach to content marketing. Instead of playing it “by the seat of your pants” you content strategist should create detailed content calendars and provide examples of successful marketing campaigns that your company can use for inspiration. Understanding shifts in the market and research content optimization strategies require that a content strategist understand how to look at data and tell stories. If a content strategist is not able to build a story around raw data, that strategist will not be able to identify opportunities or structure content around a central business need. Competitive analysis, marketing analysis, and website audits are just some of the advanced approaches that a content strategist needs to understand if they want to be successful. Understand what type of content works on different platforms, times, and types of content are essential to maximize the impact that your investment will have on your business. When Should You Hire A Content Strategist? If you are looking to grow your online presence, then you need to align content with the needs and questions of your customers. Creating content costs a lot of time and money, so if you want to optimize your marketing budget, then a robust content strategy is the best approach with an experienced content strategist. You and your content strategist can work together and reference data from PPC and SEO analytics to improve your marketing efforts. You should expect your content strategist to help your business identify, create, optimize, and publish great content. The type of content that a content strategist will help you develop is everything from movies, ebooks, and blog posts. Since a content strategist should be leading the entire content strategy process, you can look some other content choices for your business. A website relaunch can be an overwhelming process. However, a content strategist understands how to conduct content audits, comparative website SEO audits, and develop a content matrix for your online presence. Direct your company’s content efforts with precise planning. This is done by developing a content calendar, voice and tone guidelines, and content briefs. Optimize your CMS redesign with taxonomy and metadata recommendations. Since content strategists understand how content should be arranged, they can help you optimize information that organizes your business content. Create social media content with social editorial calendars, and examples of successful social media campaigns. Your content strategist should also help validate decisions with social media analytics. Lead the SEO marketing and analytics efforts across your brand by providing expert SEO recommendations and optimize content to get found by search engines. What Skills Should You Look For In A Content Strategist? 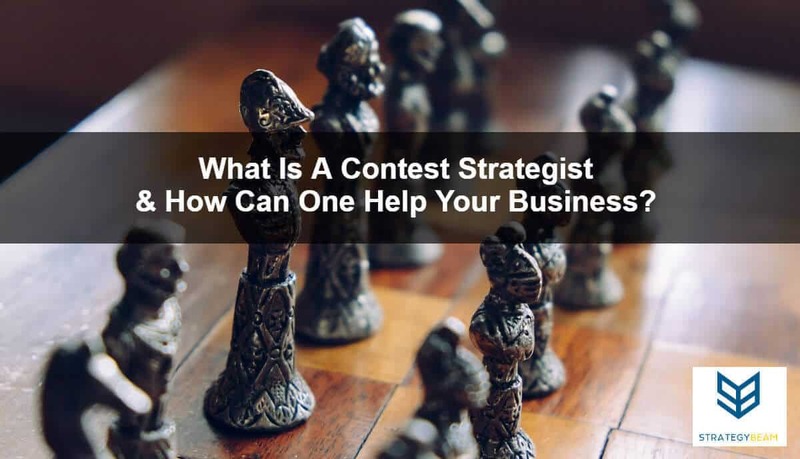 Since content strategy is a holistic approach to online marketing, if you are looking to hire a content strategist then you should expect them to be an expert with Internet marketing strategies. A strong background in SEO marketing, PPC management, social media marketing, and freelance copywriting is a must. A great content strategist will also have experience working with other aspects of digital marketing and knowledge on how to leverage different content types. Not all content strategists have a Marketing degree, and some of the best content strategists are self-taught. Your content strategist should be well read and updated on the latest marketing trends in multiple areas of online marketing. Content strategists usually work regular business hours, although freelance content strategists should be able to work on a more flexible schedule. The most important part of working with a content strategist is to understand that this position is a holistic approach to marketing, and if you want to receive the most benefits from your content strategist, then you need to work with them to understand your business, customers, and goals. If you are looking to grow your business and gain a competitive edge in the market, then you should think about hiring a freelance content strategist. This type of role is not a quick or easy way to boost your online rankings, but over time you will see improved user engagement across your online presence. An excellent content strategist will help you identify opportunities, create content based on the needs of your content, optimize content to get found by search engines and develop a strategy to boost conversions.